We believe dog cancer vet Dr. Demian Dressler offers one of the best resources for enhancing your dog cancer research. And now, his new Dog Cancer Kit has everything you need to lead a good fight, including a $30 off coupon for Apocaps CX Apoptogen Formula immune support supplement. Dr. Dressler’s “Full Spectrum Approach” (as seen in The Dog Cancer Survival Guide), embraces the most proven holistic and conventional cancer therapies. Among them is Apocaps CX Apoptogen Formula, a nutritional immune support supplement created by Dr. Dressler that utilizes natural plant-based substances such as Luteolin,Curcumin and Apigenin. These Apocaps ingredients have been clinically shown to induce the body’s natural process of apoptosis, which is simply the process of healthy cell death that allows new cells to grow and keep deadly cancer cells away. If you want to see how Apocaps can boost your dog’s immune system, you can download a $30 off Apocaps coupon when you sign up for Dr. Dressler’s Dog Cancer Kit. As you’ll read in our Dog Cancer Survival Guide book review, we give three paws up to Dr. Dressler for his approach of embracing all treatment options. and although we haven’t tried Apocaps ourselves, many Tripawds members have given good reviews for Apocaps. You can ask them about their experiences in our Eating Healthy Discussion Forum. 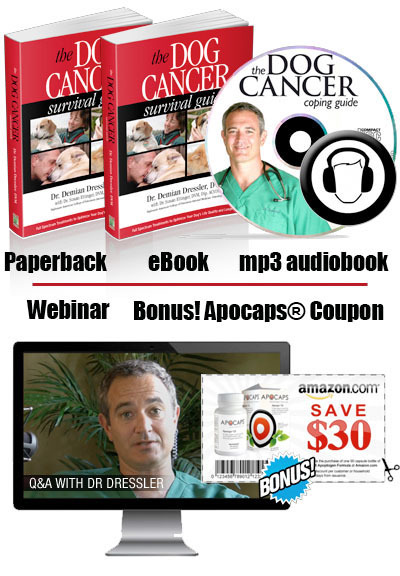 One aspect that makes the Dog Cancer Kit so terrific is that buyers get a lifetime membership to one year of Dr. Dressler’s webinar recordings and a free ticket to one live webinar where you can ask questions about your dog’s health. Not only will you have access to this information now, but you’ll always have it there if you are ever in the tough situation of another canine cancer diagnosis. Sadly, we know many Tripawd members who have been there. We’ll share more about Dr. Dressler’s Dog Cancer Kit in upcoming blog posts. 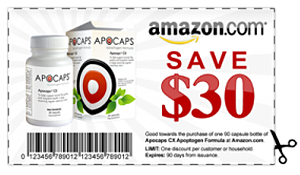 For now, if you want to give Apocaps a try you can purchase it through Amazon or better yet, take advantage of this $30 coupon waiting for you when purchasing Dr. Dressler’s Dog Cancer Kit.